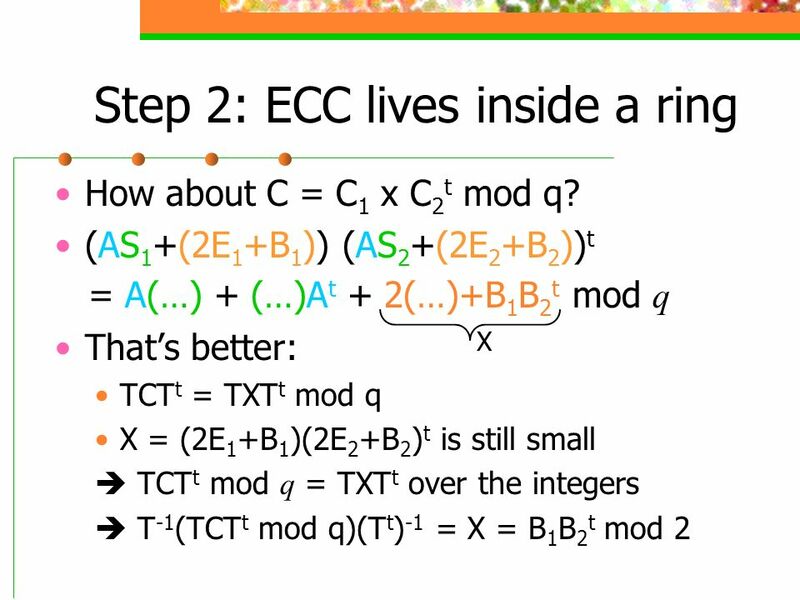 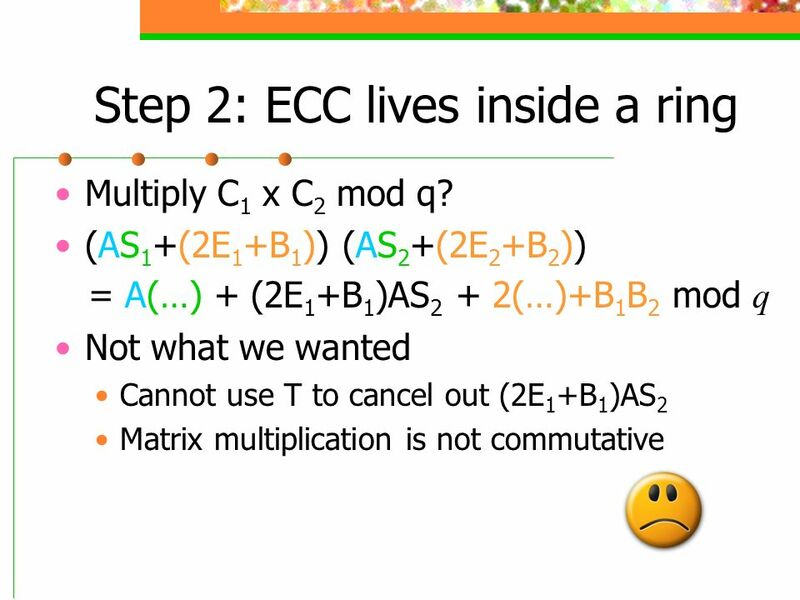 Step 1: Encryption from linear codes SK/PK are Good/Bad representation of code Bad representation, can’t tell words close to code from random Good representation can be used to correct many errors Additive homomorphism “for free” Step 2: ECC lives inside a ring We have both additive, multiplicative sructure If code is an ideal, also multiplicative homomorphism for low-degree polynomials Step 3: Bootstrapping, Squashing, etc. 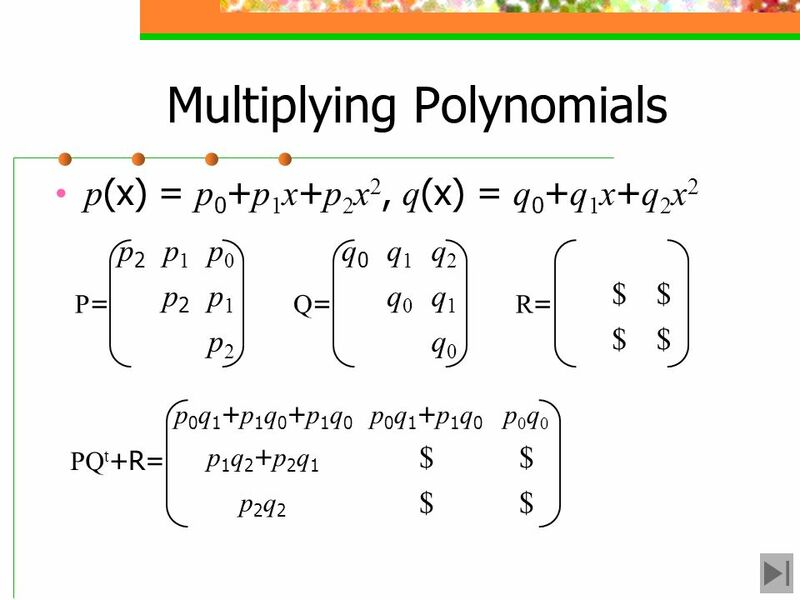 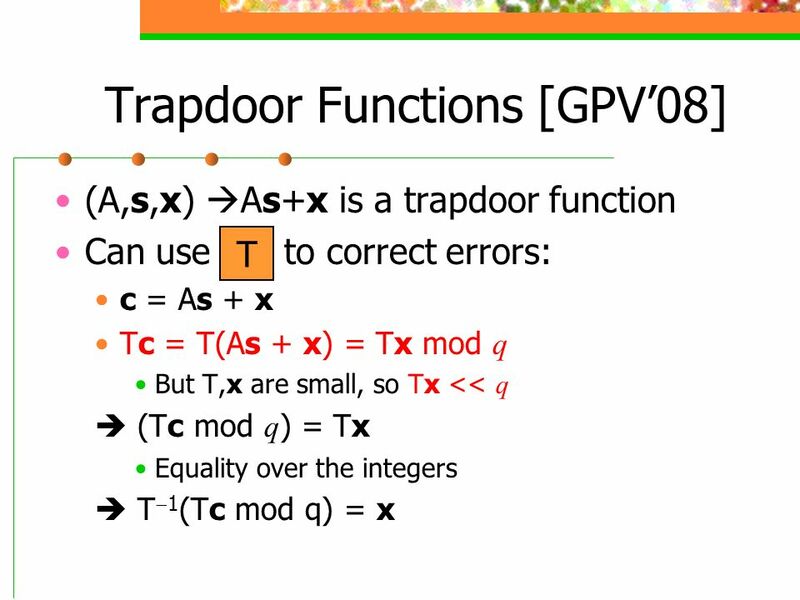 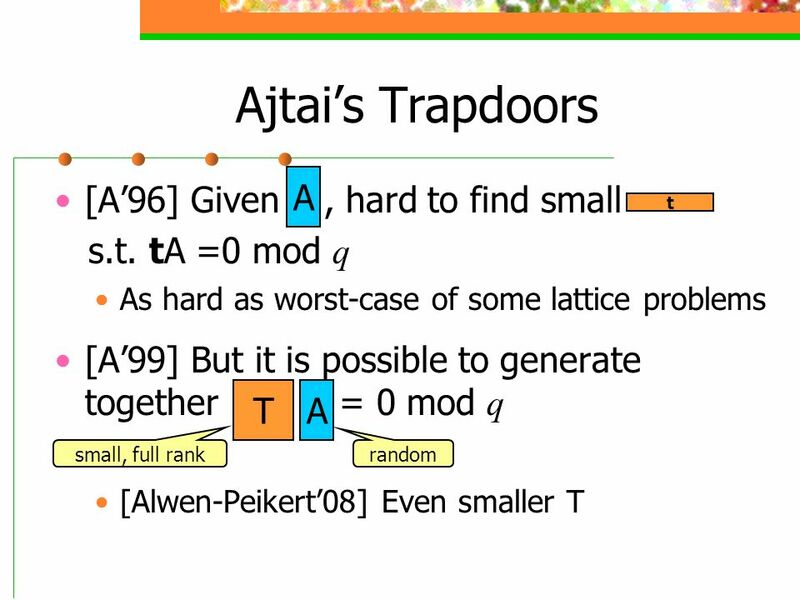 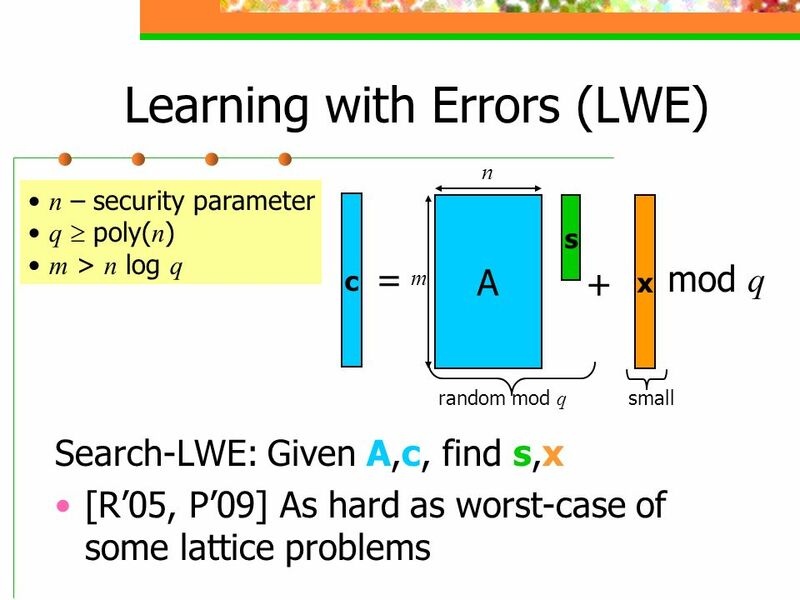 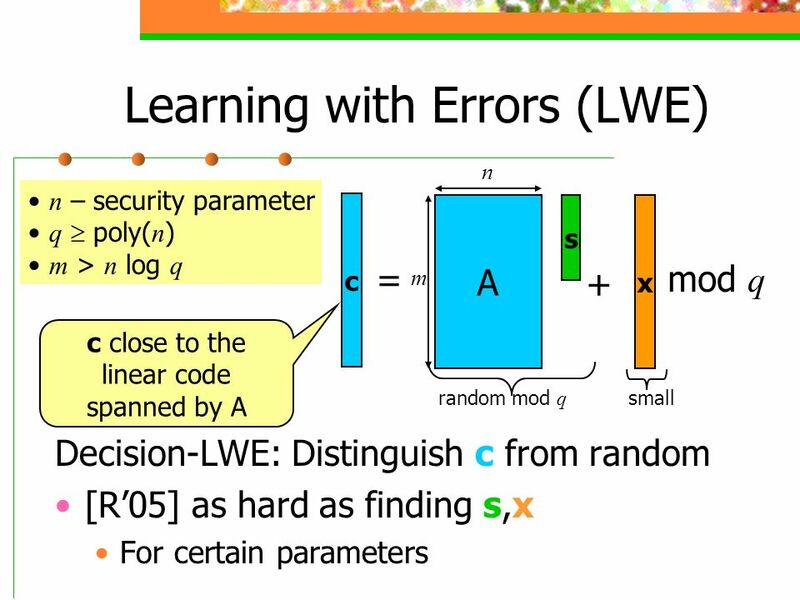 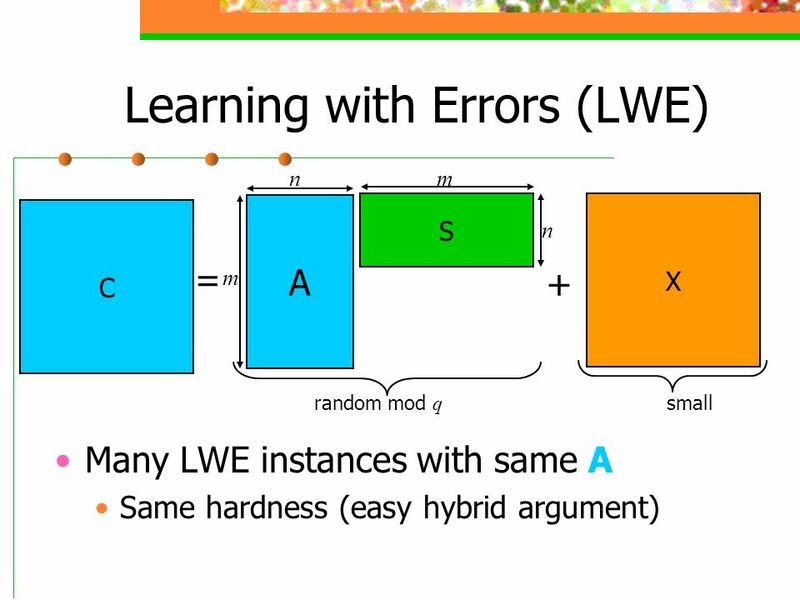 Download ppt "A Simple BGN-Type Cryptosystem from LWE"
Impagliazzos Worlds in Arithmetic Complexity: A Progress Report Scott Aaronson and Andrew Drucker MIT 100% QUANTUM-FREE TALK (FROM COWS NOT TREATED WITH. 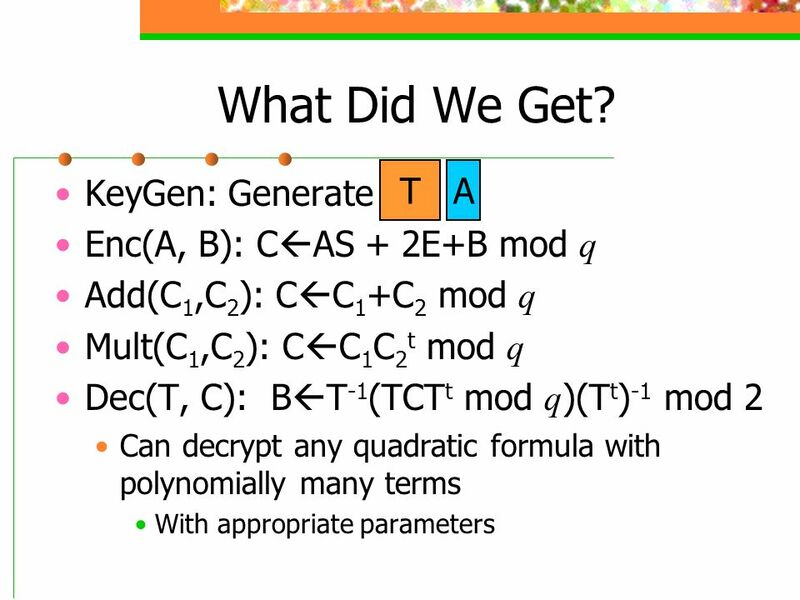 Attacking Cryptographic Schemes Based on Perturbation Polynomials Martin Albrecht (Royal Holloway), Craig Gentry (IBM), Shai Halevi (IBM), Jonathan Katz. 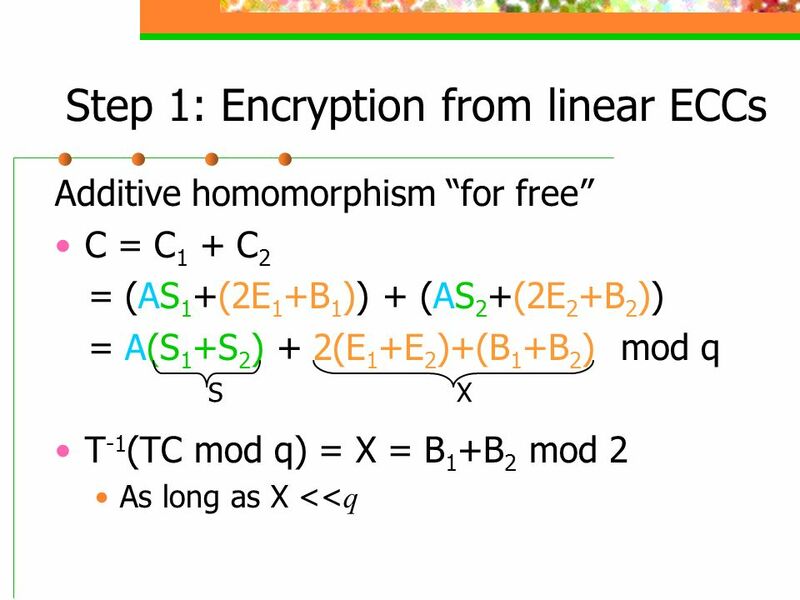 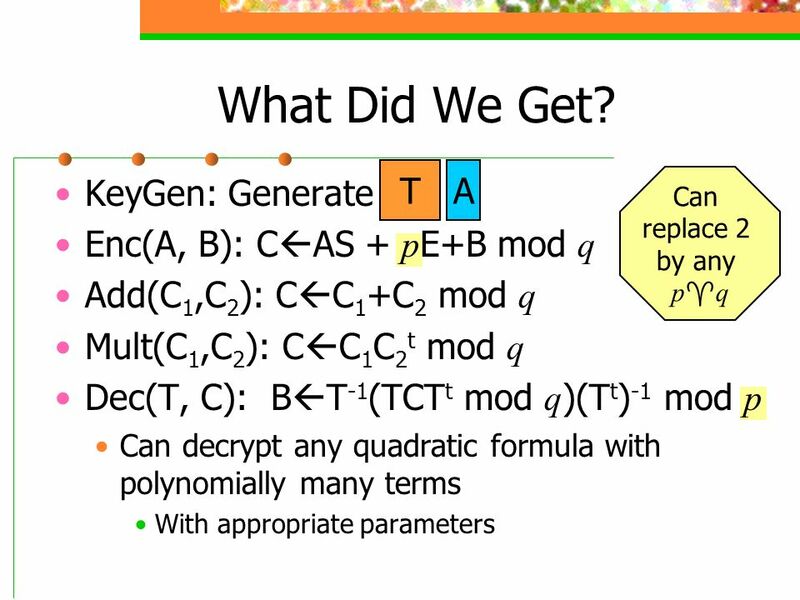 Fast Cryptographic Primitives & Circular-Secure Encryption Based on Hard Learning Problems Benny Applebaum, David Cash, Chris Peikert, Amit Sahai Princeton. 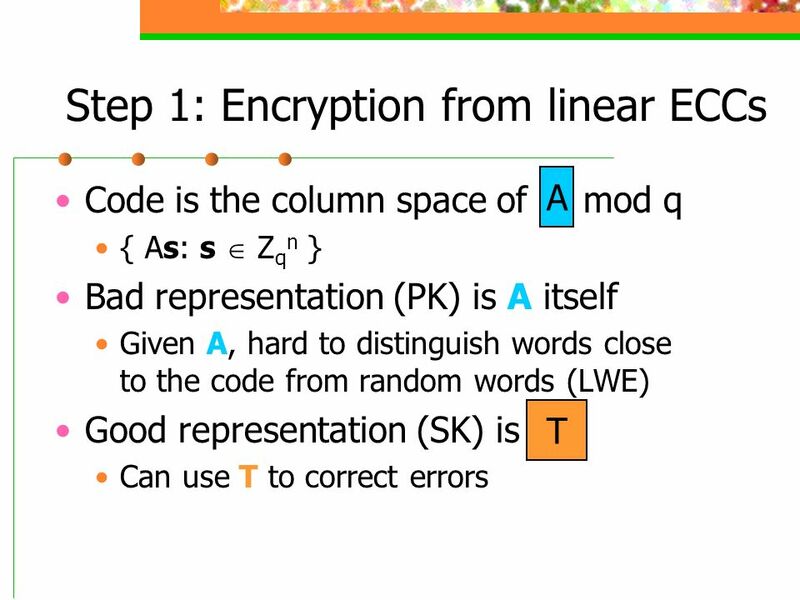 Efficiency vs. Assumptions in Secure Computation Yuval Ishai Technion & UCLA. 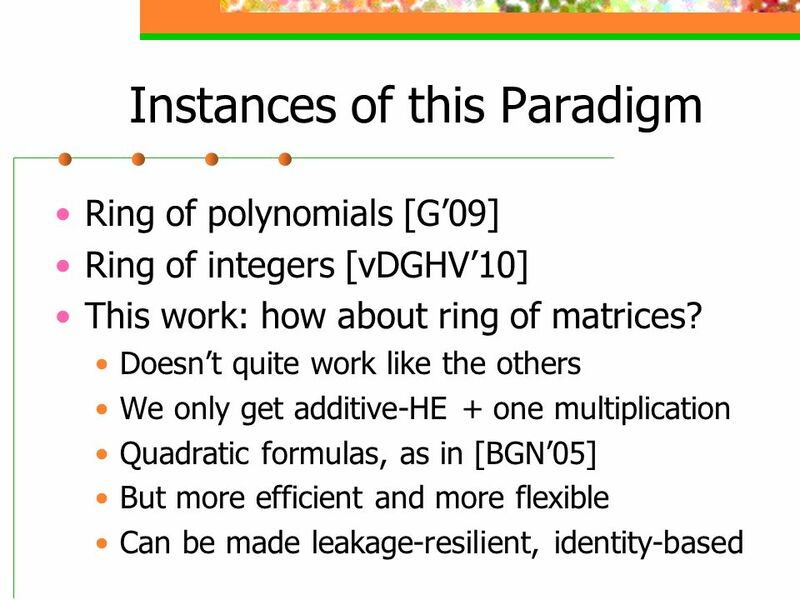 CRYPTOGRAPHIC MULTILINEAR MAPS: APPLICATIONS, CONSTRUCTION, CRYPTANALYSIS Diamant Symposium, Doorn Netherlands Craig Gentry, IBM Joint with Sanjam Garg. 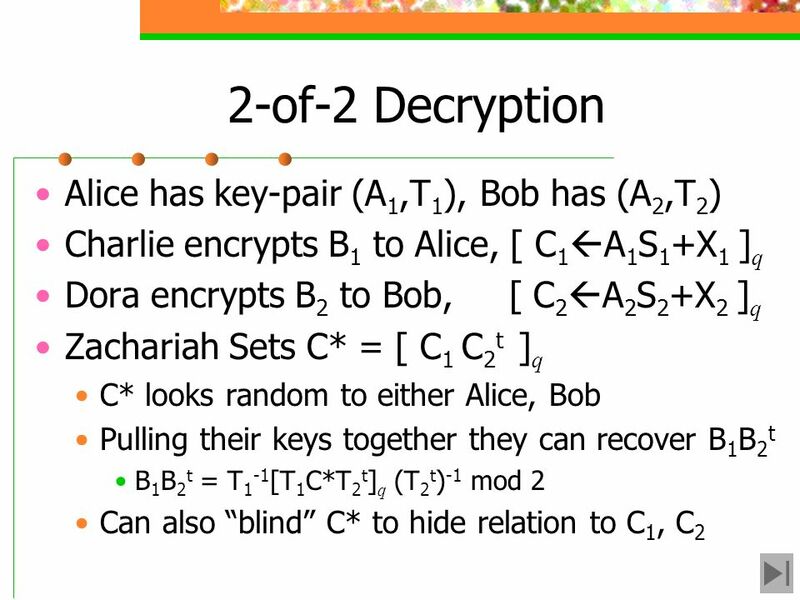 Many-to-one Trapdoor Functions and their Relations to Public-key Cryptosystems M. Bellare S. Halevi A. Saha S. Vadhan. 14. 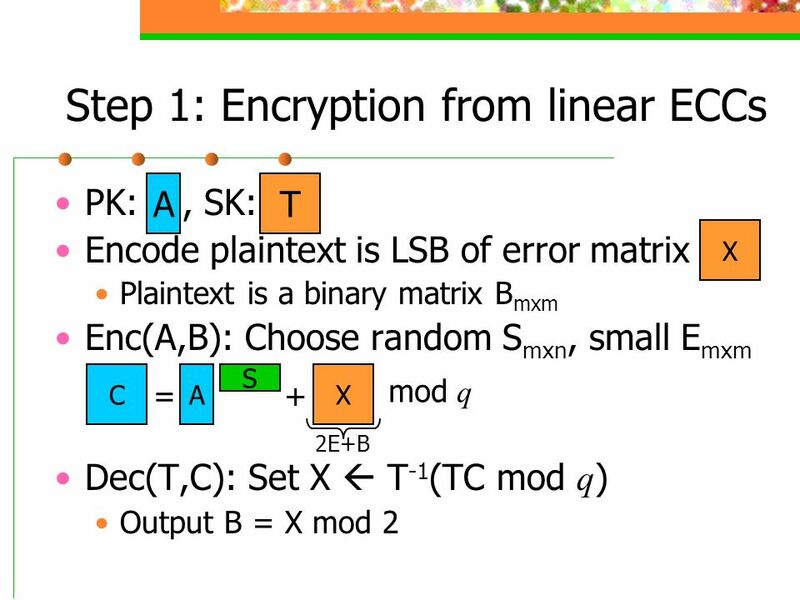 Aug Towards Practical Lattice-Based Public-Key Encryption on Reconfigurable Hardware SAC 2013, Burnaby, Canada Thomas Pöppelmann and Tim Güneysu. 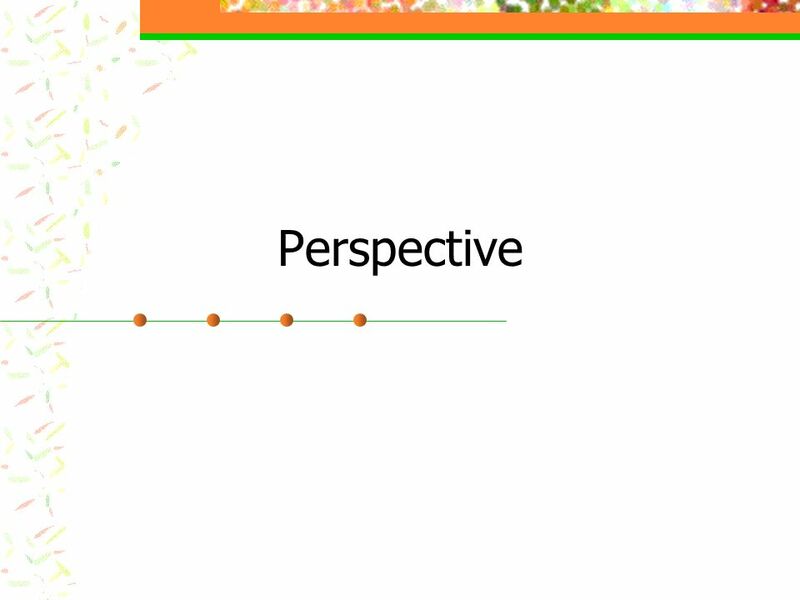 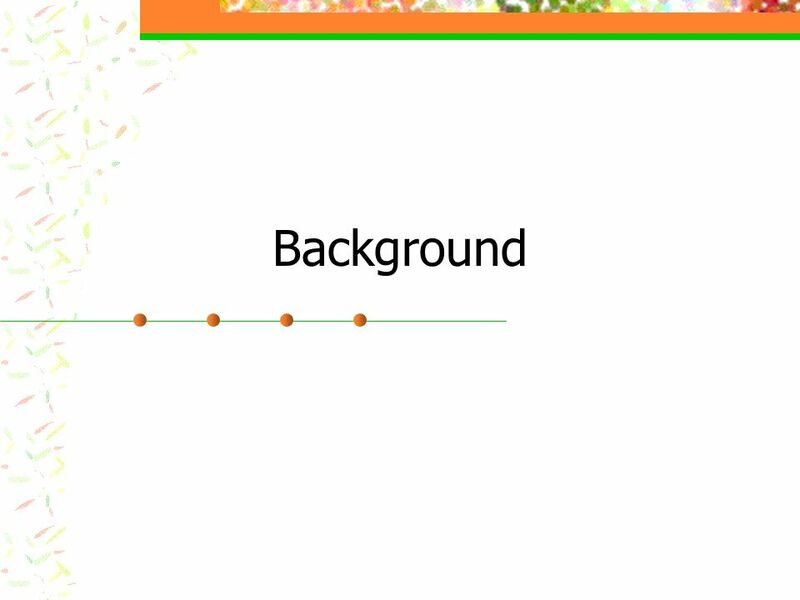 Paper by: Craig Gentry Presented By: Daniel Henneberger. 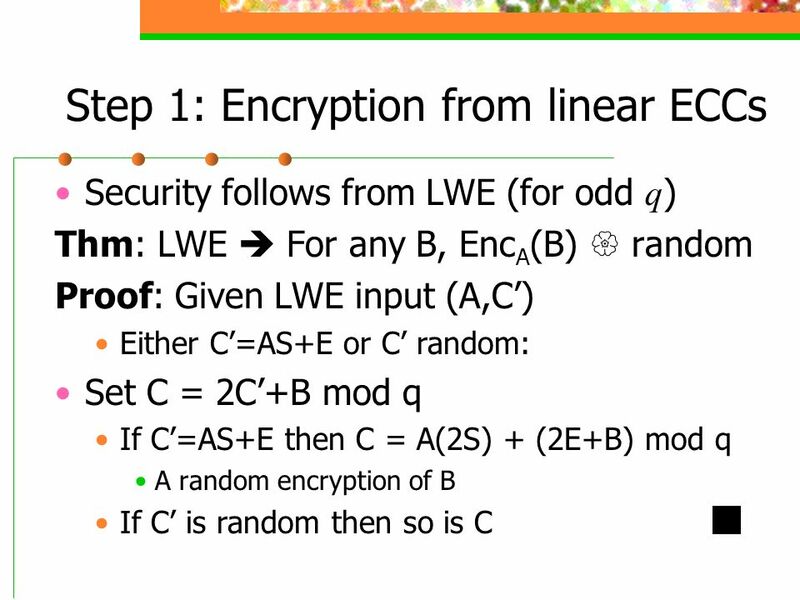 Foundations of Cryptography Lecture 13 Lecturer: Moni Naor. 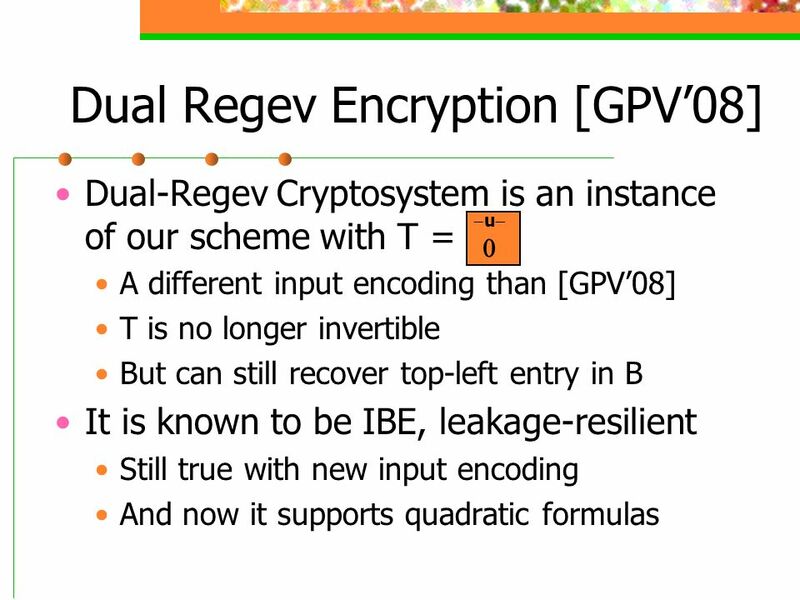 Cramer & Shoup Encryption Cramer and Shoup: A practical public key crypto system provably secure against adaptive chosen ciphertext attack. 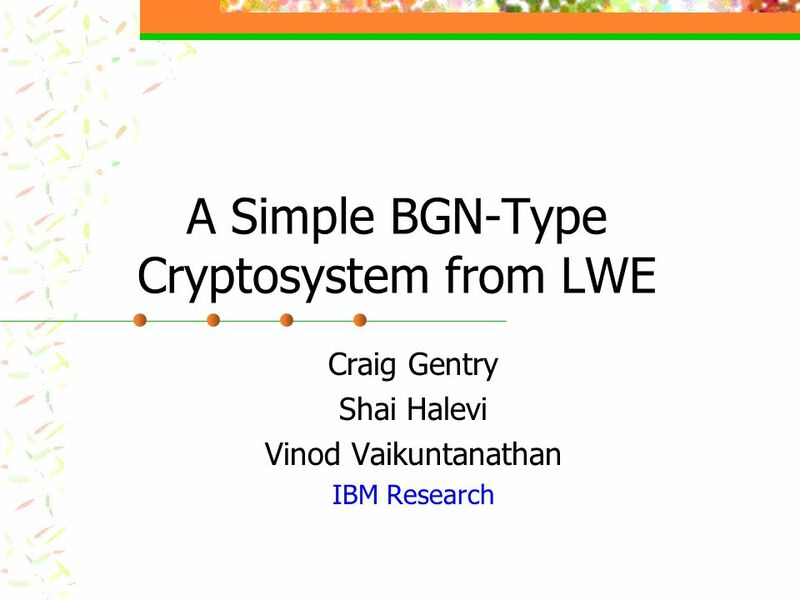 Crypto 1998. 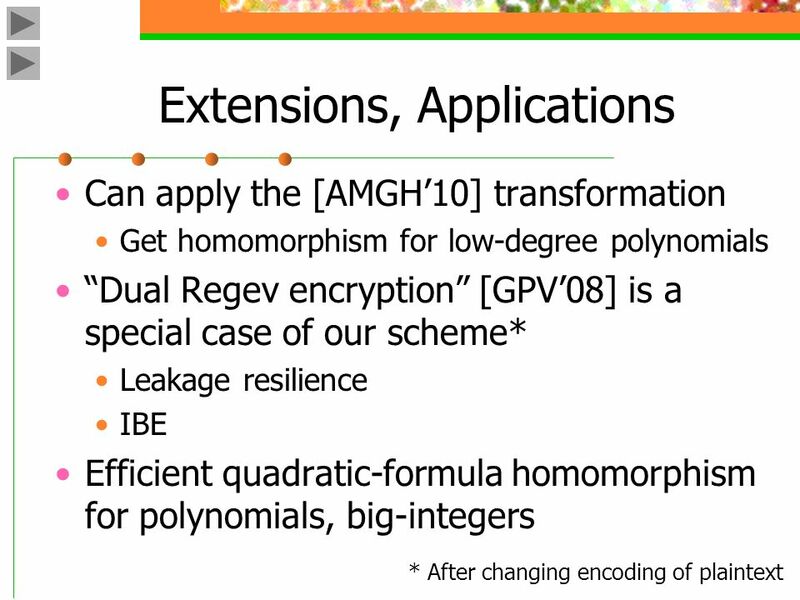 On Homomorphic Encryption and Secure Computation challenge response Shai Halevi June 16, 2011. 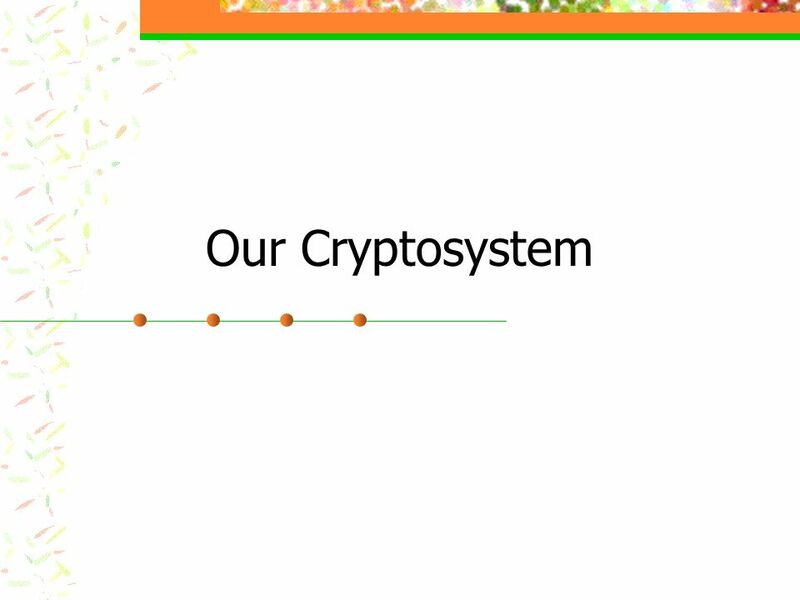 Key Exchange in Systems VPN usually has two phases –Handshake protocol: key exchange between parties sets symmetric keys –Traffic protocol: communication.